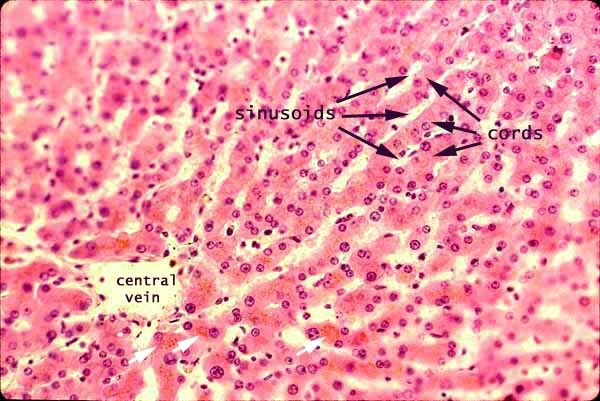 Hepatocytes are arranged into cords, separated by vascular sinusoids. In this image, the cords are the solid substance (mostly bright pink hepatocyte cytoplasm) separated by the clear space of sinusoids. In most normal histological preparations, blood has drained from the sinusoids and they appear empty (or with an occasional white blood cell). But they may also appear filled with red blood cells. Lipofuscin, in the form of yellow or brown pigment granules, is sometimes evident in hepatocytes, especially those toward the centers of lobules. In the image at right, lipofuscin can be seen as a grainy orange coloration in several hepatocytes (also white arrows in the image above, in the neighborhood of the central vein). Lipofuscin represents the presence of lysosomes that have accumulated a noticable amount of indigestible residue. Lipofuscin is sometimes called "wear-and-tear pigment", since the amount increases over time (i.e., with advancing age) in cells like hepatocytes and neurons which are both permanent (not routinely replenished) and metabolically active. For another illustration of lipofuscin accumulations in liver, see WebPath. Note that most nuclei in this image appear large, round and fairly euchromatic. These are the nuclei of the hepatocytes. They often appear paired, since hepatocytes are commonly binucleate. Numerous other nuclei may also be seen scattered throughout the image, all appearing smaller, denser, and more flattened or elongated than hepatocyte nuclei. These belong to the endothelial cells which line the sinusoids, to Kupffer cells which are often draped across the sinusoids, and to fibroblasts. Each of these cell types has a characteristic position. Fibroblasts (which produce the reticular collagen fibers that support the hepatic cords)are found between the endothelium and the hepatocytes, in the space of Disse. Kupffer cells are found within the sinusoids. And endothelial cells actually comprise the sinusoidal endothelium. In routine specimens, these cells are rather impractically difficult to distinguish from one another.